Do you ever dither over decisions? You know...worry about the money or the logistics or the whatever to the point that you have a hard time making the decision at all? I've been dithering like this over a decision to participate in a writing pilgrimage to Ireland next year led by Christine Valters Painter, Abbey of the Arts. I've blogged about the Abbey before and raved about its online offerings. I spent 8 days in west Ireland in 2014 with Christine and her husband, John on a monastic pilgrimage. So I know how just rich, inspirational, and special this writing retreat, Writing on the Wild Edges of the World will be. 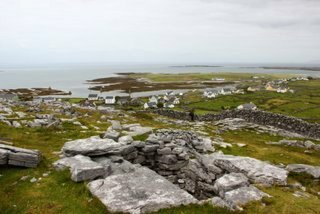 It's 6 days on Inishmor, the Aran island that I vowed I'd return to when we visited there in 2014. Yet....I still dithered. Until yesterday, that is. I made a quick trip into Cajarc at noon to post a bill. As I turned to get back into my car, a voice called to me. A woman in shorts, backpack and hiking boots asked me for directions to the tourist office. I could tell she wasn't French, so asked if she spoke English. She did. In fact, she was Irish! We chatted for a few minutes about walking the chemin (she'd already done the Moissac to Compostelle part and is now doing the 'backside' Le Puy to Moissac), where I'm from, where she's from, Galway, Inishmor. She was delightful and even taught me my first Irish word: madra (dog). I took it as a 'sign,' came home and registered for the writing retreat which will happen in April 2017. After all, how often to you run into an Irish woman in the deep heart of France? I'm still worrying about the money, the logistics and the whatever, but I'm pretty certain that the Universe will take of those things...and that it wants me to go back to Inishmor!